Casino Poker is a poker game with a twist: you can place a fixed side bet for a chance to win a huge progressive jackpot! This Vegas-style card game is based on the popular casino game. It is played with a standard deck of 52 cards, shuffled at the start of each game. Keep 'Em Going - based on 5-card stud poker, will you pull your bets or Keep 'Em Going? Why not spice this Vegas game up with a side bet on the same progressive jackpot as you see on Casino Poker. The aim of Casino Poker is to beat the dealer's hand to win. The result and the amount you can win depend on the value of your hand. In addition, you can place a side bet on the progressive jackpot for a chance to win big money. You may place as many chips as you like on the bet area (ANTE), provided that you will still have enough chips remaining to place a CALL bet during the game, and provided that you do not exceed the maximum stake of £500 (the minimum stake is 10p). Once you press 'Deal', 5 cards each will be dealt to you and to the Dealer. The Dealer's cards will be dealt face down apart from the last card. Once each hand has been dealt, you'll be given the option to Call or Fold. If you choose to CALL then a stake equal to double your ANTE bet is automatically placed on the CALL bet area and deducted from your chip balance. If you choose to FOLD, you will forfeit your stake and the game will end. 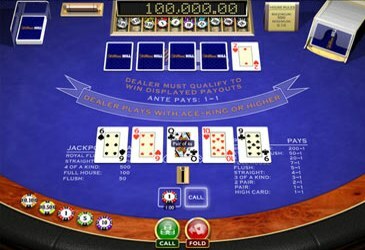 Once you have selected CALL or FOLD, the Dealer's hand is turned face up and the result will now be displayed. The Dealer needs a hand including at least a King and an Ace in order to qualify to play. If the Dealer qualifies, then your hand is compared with the Dealer's and the best hand wins. If you win, your winnings are paid out according to the following table. If the Dealer does not qualify, you win the ANTE bet but the CALL bet is a push, so you will be paid out on the ANTE and your CALL stake will be returned to you. If the Dealer qualifies but your hand is better, then you win both the ANTE and CALL stakes. If the Dealer qualifies and the hands are tied, then the game is a push, so both your ANTE and PLAY stakes are returned to you. If the Dealer qualifies and beats your hand, then you lose both your ANTE and CALL bets. If you wish to enter the progressive Jackpot, you must place a £1 chip in the slot before you press 'Deal'. The full Jackpot amount is paid out only if your hand is a Royal Flush. It will be paid in addition to the 200-1 payout for your poker hand. If your hand is a Straight Flush, you'll win 10% of the current Jackpot value. Four Of A Kind, Full House and Flush are all paid at the set amounts of £500, £100 and £50 respectively (see paytable below). A Jackpot win is paid out directly to your account balance.